Thirty nine per cent of Brits would be happy to stop using cash in the future. According to exclusive data provided to Business Insider, 17% of British adults “definitively” envision going completely cashless, while a further 22% think it is “likely” to happen at some point in the future. 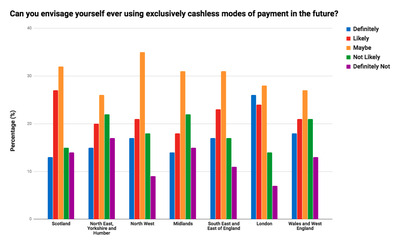 Londoners were the most likely to be ready to ditch cash, while those in the Midlands are least willing. The data was compiled by market research firm Kantar TNS. Almost 40% of Brits can see themselves ditching the use of cash altogether in the future, according to a new poll conducted exclusively for Business Insider. 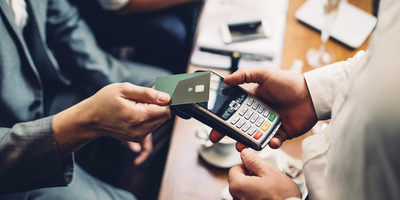 The poll, undertaken by market research firm Kantar TNS found that 17% of British adults “definitively” envision going completely cashless, while a further 22% think it is “likely” to happen at some point in the future. By contrast, just 12% of people surveyed said they would “definitely not” give up cash at any point, and 18% said it was “not likely” they would ever stop using cash. Cashlessness is something of a polarising concept. Some believe that within decades cash will cease to be, with MasterCard’s UK and Ireland boss Mark Barnett telling Business Insider in 2016 that in 30 years handling physical money will seem as old fashioned as the horse and cart. “By the time we get to another generation, 30 years down the track, will there be any cash? I very much doubt it. The idea of carrying coins – 2p, 1p, 50p all cluttering up your pocket – it will be an anachronism. It will seem as antediluvian as carrying a pouch full of gold,” Barnett said. 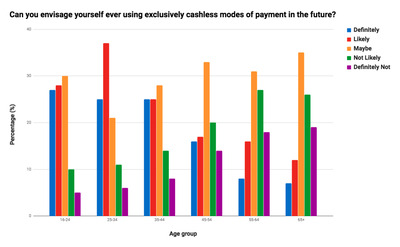 Kantar’s evidence suggests that while many people in the UK are ready to go cash free, it is not quite a mainstream view, and in certain segments of society, cashlessness is a long time in the future. 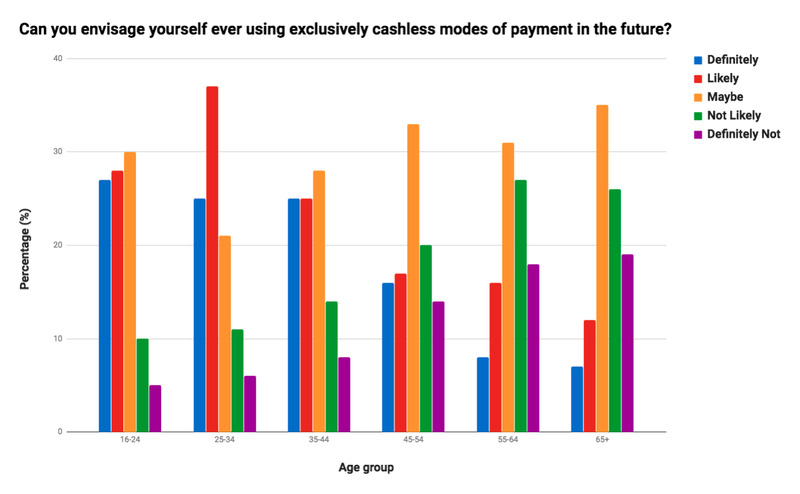 There is a clear generational divide among Britain’s population when it comes to cashlessness, with more than 60% of those aged between 25 and 34 saying they can see themselves going cashless. Only 22% of those over 55 envision ever going cash free in the future. 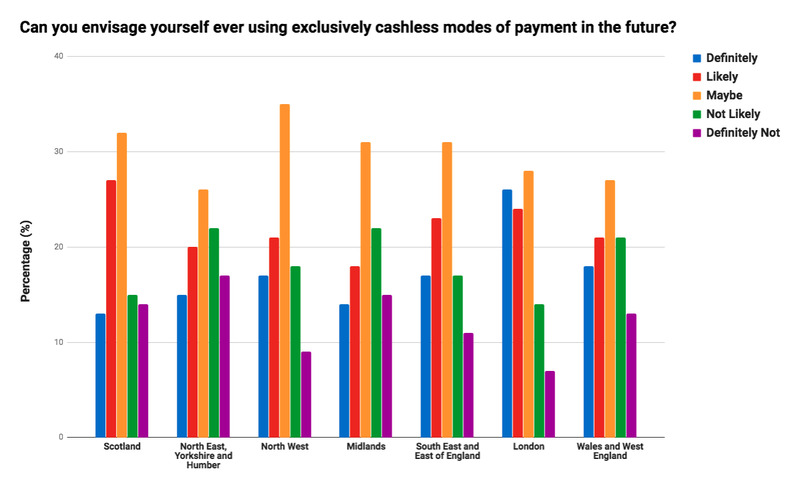 Geographically, people in London are the most likely to be ready to go cash free, with half of the capital’s population willing to ditch physical money in the future. At the other end of the spectrum, residents of the Midlands are the least likely to leave cash behind, with only 32% of people saying they’d go cash free.